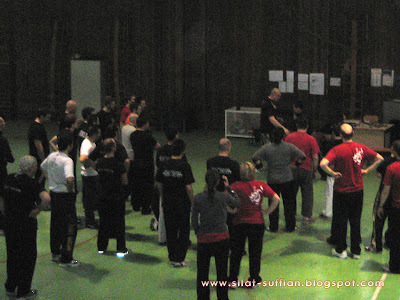 Another successful Silat Suffian Bela Diri - International Bruneian Martial Arts Seminar. This is the 4th seminar for the 2008 SSBD World Tour. The Seminar was hosted and organized by the SSBD Italian group leader - Carlo Andreis (AMADA Association) in Desenzano Del Garda, Italy. It was held in the afternoon of 23rd February 2008, from 2 pm to 6.30pm. It was attended by more than 40 participants from different parts of Europe. Instructors and practitioners from varied martial arts styles attended, from Indonesian Silat, Filipino Kali, Escrima, Jeet Kune Do, Capoeira, Lao Long Dao (vietnamese), Wing Chun Kung Fu, Kung Fu, Brazilian Jiu Jitsu, Karate, Military Combatives, etc, left their ego at the door and came to experience, give support and exchange ideas. It was great to see old faces (friends) and welcoming the new. I would like to convey my deepest appreciation to all those who participated for their openess and determination to attend the Bruneian Martial Arts Seminar, especially for those who drove from far way, some up to 3hrs, 4 hrs and 8hrs to attend the seminar - words cannot say what my heart feels. To Carlo and Rima Andreis for their organizational skills, to those translating for me in the seminar - Marco Banfi and Enrico Luciolli. Christian Alfano and Joe Brandt for being great individuals for enduring the responsibility as my recievers in the seminar, and everyone that helped me in this seminar and thier patience in accepting what I have taught. For Antonio Bonelli, who gave me a surprise by tatooing the SSBD logo on his forearm, he said "for respect, I did not write the name of SSBD (only the logo), SSBD is written in my heart"; his commitment to SSBD gained more than respect from me. My only hope I have not disappointed anyone who participated. My apologies if I miss anyone for whom credit was due or mistakes are made in any spelling, please contact me to correct it. This workshop like my other events aims primarily to raise the curiosity and awareness among people from different nationalities about the martial heritage and culture of Brunei Darussalam in general. The seminar intends to cover the basic movements to instill muscle memory from the use of the machete and translating it to machete - knife and to empty hands movements. After the basic introduction, the seminar started with the basics of countering a machete attack from a sheathed position. Then the drills used to instill the correct body positioning and muscle memory was instructed, demonstrated and its history explained in detail. The correct mentality training was also instructed - always assuming that there are multiple attackers - specific drills of awareness was done by changing partners continuously, spontaneously without thinking. After the the instruction of single machete, the basic body mechanics was translated to machete-knife technique movements - emphasis was made on disarming, its detail and mentality. The Seminar also covered empty hands on the last part, again using the same body mechanics as the machete and mechete-knife. The participants were taught how to intercept any incoming attack offensively rather than defensively. Feedbacks from the seminar, during and after the event was very encouraging. Everyone wanted to know more about Bruneian Martial Arts and Brunei Darussalam in general. Please enjoy the picture from this event. . I was also training the new 2nd SSBD Italian Training Group on the morning of this visit. The links and articles in this site will still be available. Apologies for the inconvinience. See you there. All rights reserved. 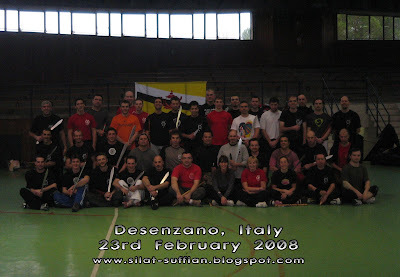 Silat Suffian Bela Diri, Silat Suffian, Perguruan Silat Suffian Bela Diri, Pertubuhan Seni Silat Suffian, Silat Suffian Bela Diri International Groups. No material may be used, copied, reprinted or have derivative use made of it without written permission from Maul Mornie. Public performance rights, including all seminars, workshops, camps, courses or any other public instruction, are included.